Create or Upload Parts P.O. 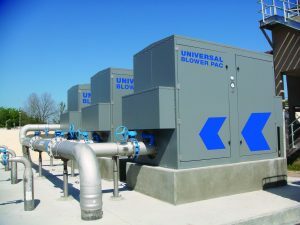 Through the years, Universal Blower Pac has been called upon to partner with leading OEMs to create custom blower systems that not only increase performance and efficiency within the wastewater and industrial treatment processes, but also to engineer how designs can cut down on costs in the field during installation and planning for long term use and maintenance. 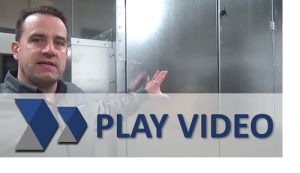 In this video, Jay Guio, lead OEM Sales Rep, walks through a unique custom system engineered for an OEM for a Fortune 100 Petrochemical client. This design consists of three 150hp aeration blower systems and two 30hp air scour blower systems. The air scour blower systems were designed with a shared sub base and a common header factory installed to cut down on time in field. Additionally, cable trays were pre-engineered to also alleviate work time on the site. Each system is designed with UBP’s state of the art sound enclosures, made with 3/16 stainless steel to withstand harsh environmental wear and corrosion. IEEE 841 motors are installed to withstand the severe process for the petroleum and chemical industry. These motors are directly coupled to the blowers to additionally improve overall system efficiency and performance as well as increase the lifespan of the units. This direct drive design provides the user 100% control over the system with use of VFD (variable frequency drive) and eliminates power transfer loss typically associated with a v-belt drive design making it 3-5% more efficient. Maintenance time and cost is also cut down as tensioning and replacing v-belts is not needed. If your plant is looking for a new or upgraded system to improve efficiency, performance and maintenance, call or email inquiry to discuss your system goals and requirements. The 3C-Hybrid Blower System continues to make waves in the water and waste water treatment marketplace as a best in class, high efficiency system that is both affordable and delivered quickly. 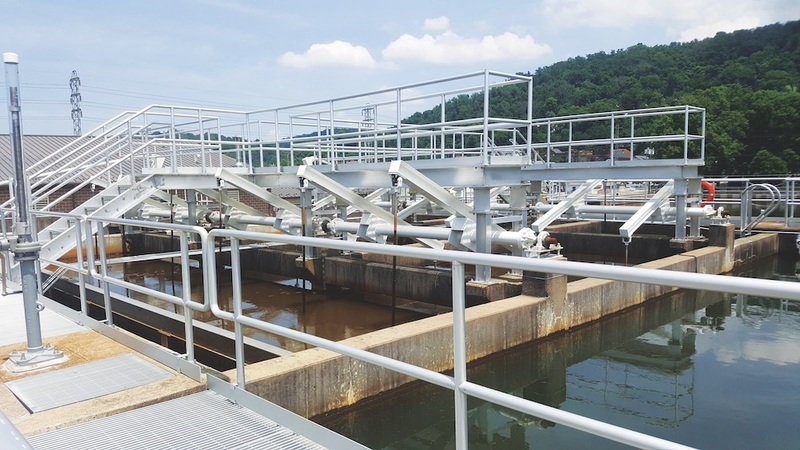 This year, UBP was thrilled to be one of the recipients for Water and Wastes Digest (W&WD) Top Project 2017 Awards for the water treatment plant upgrade for the City of Wheeling, West Virginia. UBP thanks all the contractors and consultants involved in the project, and a big congratulations to the City of Wheeling for demanding excellence in providing quality drinking water for their community. To download a data sheet for the 3C-Hybrid, please visit our Resource Center. To read more about this Top Project 2017 award from Water and Wastes Digest, click here. 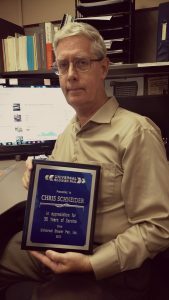 This month, Universal Blower Pac is proud to celebrate and honor the dedication and service that Chris Schneider, our Senior Estimator, has provided to our clients for 30 years strong. Chris is ‘an encyclopedia of equipment knowledge and knows product details inside and out,’ says Natalie Menke, President of UBP. It’s not discussed often, but getting a clear understanding and helping our clients to ask the right questions about their exact equipment needs from the start is many times what separates UBP apart from the competition. Avoiding surprises and clarifying expectations takes skill. It’s the combination of engineering knowledge, eye for detail, and 30 years of knowledge from thousands of world-wide UBP installations that Chris brings to bear when evaluating system quotes. Not all blowers and systems are the same. A value add that our clients receive during the quoting process at UBP is that we provide value engineering analysis and recommend comparable options within our quotes from the start. 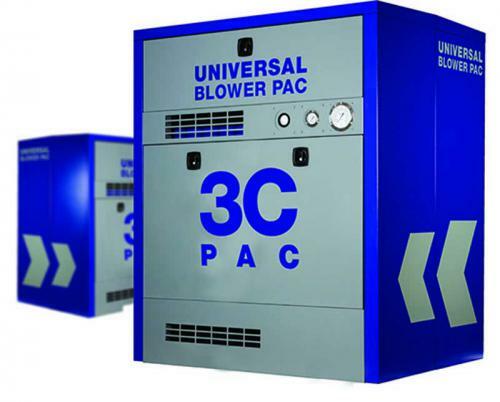 Sometimes specified manufacturers require ancillary equipment unnecessary for Universal Blower Pac’s system requirements. Calling out exceptions often saves hundreds, or in some case, thousands of dollars in equipment or controls which don’t apply to our equipment. Chris points these items out during his initial spec review and additionally provides approvable specs up front that often lead to more competitive pricing for our valued customers. Getting the job right from day one for our customers is key. When it comes to estimating and quoting equipment, you are in good hands with Chris. OSHA’s hearing conservation program is designed to protect workers with significant occupational noise exposures in various industry sectors from hearing impairment even if they are subject to such noise exposures over their entire working lifetimes. All employers are required to implement a Hearing Conservation Program where workers are exposed to a time weighted average noise level of 85 dBA or higher over an 8 hour work shift. 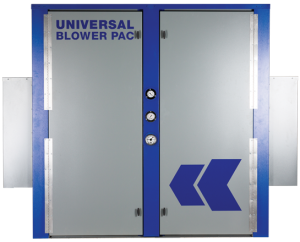 As a market leader in blower system engineering and manufacturing, Universal Blower Pac naturally understands this impact on plant managers and how best to control noise exposure for system operators. As a result, UBP has been providing state of the art sound enclosure solutions for a variety of blower systems and industrial equipment since 1979. We manufacture both standard, semi-standard and custom enclosures to help meet OSHA requirements on any budget, whether we provided the original blower system to you or not. The ATTENU-PAC is a full sound enclosure solution and comes in variety of sizes with various options. Choose from standard sizes, or engineers can make sizing adjustments to get exact fit. UBP has mastered the ability to reach acceptable noise levels with the ACOUSTI-PAC partial enclosure. This achieves up to 60% noise reduction of the ATTENU-PAC for 30% of the cost. The enclosure is designed to compactly fit around the blower, the loudest noise source. We then acoustically treat the discharge based upon frequency ranges to minimize the secondary noise sources. Our enclosures are designed to meet whatever difficult site issues, sizing, or specialty application desired. Enclosures can be designed to be lowered over existing equipment by forklift or crane or pre-built panels to be installed on site around the equipment. Custom enclosures can be designed for any type of equipment or blowers from multi-stage centrifugal to direct drive designs. A variety of options of materials and specialty features can be requested: larger vent box designs for increased airflow, removable doors or roofs, clam shell design for full walk around access, and much more. UBP Engineers are available for site visits to help advise on specialty sizing or installation issues and make recommendations on how best to achieve OSHA requirements for any equipment. 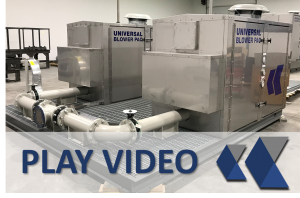 In this video, Ben Cross, P.E, Universal Blower Pac Sales Engineer, discusses the new High Pressure Hybrid Blower System. This high efficiency system features Gardner Denver’s RC3 CycloBlower, a new generation of high pressure oil free screw blowers with airflows up to 2,650 CFM, pressures up to 36 psi, and vacuum up to 22 inches of mercury making it is ideal for a wide range of applications including Wastewater Treatment, dilute and dense phase Pneumatic Conveying, Chemical Processing, Industrial Processing, Food Processing, and Plastic Molding and Handling. This hybrid design is engineered with the goal of delivering a new level of efficiency and performance that will provide our customers with competitive advantages and energy savings they won’t find in other blower systems. 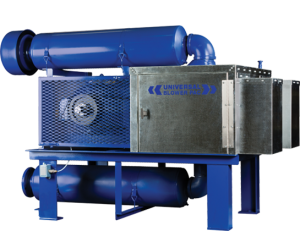 With energy consumption typically being the largest cost of ownership, UBP’s High Pressure Hybrid Blower System can save thousands on energy bills, lowering your bottom line, and increasing profits. 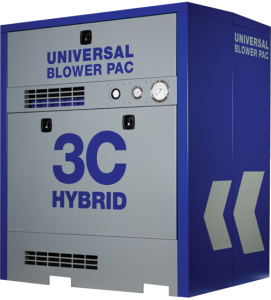 As with all Universal Blower Pac solutions, this system can be engineered with flexible options and installation configurations to meet exact needs. The 3C-PAC gets a product showcase in the November 2016 issue of TPO (Treatment Plant Operator) Magazine. 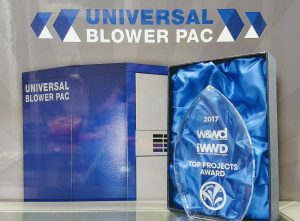 Click on TPO Magazine link below to see article or to receive more technical specs, drawings, or to discuss how this efficient, compact, standard positive displacement blower system can help you achieve your plant’s system needs, please email our Sales Engineering team sales@universalblowerpac.com. 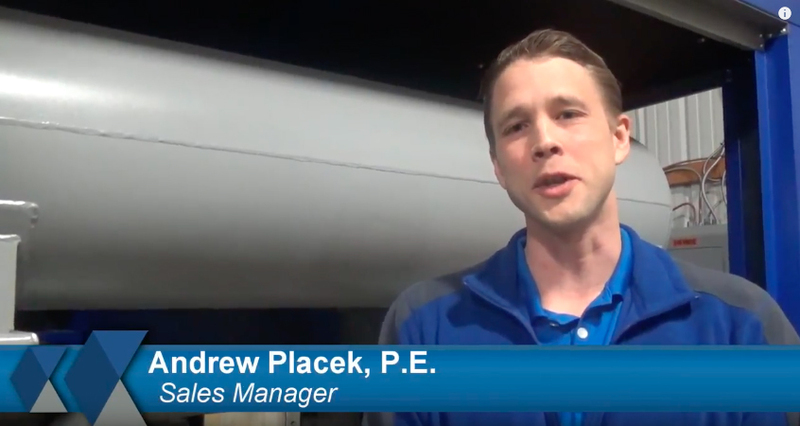 In this video, Andrew Placek, Engineer and Sales Manager at Universal Blower Pac, walks through and tests the advanced features of the EE-PAC. Click here to see it! The EE-PAC offers a low maintenance, low noise, advanced high efficiency screw blower system that delivers air efficiently across its entire operating range. This patented design is 35% more efficient than traditional PD blowers and achieves turbo blower efficiency over a 5:1 turndown, but able withstand higher pressures and temperatures to negate risk of surge or hassle with complex controls, thus ensuring reliable performance and longevity. Turbo blowers typically only meet a 2:1 turndown before surging and have limited operating and pressure ranges as well as expensive costs due to blower failures requiring entire unit replacement. The EE-PAC features a positive displacement compressor and won’t surge, thus allowing for operation of multiple units on a single header. Unit repair is inexpensive and can be serviced from multiple sources to minimize downtime. 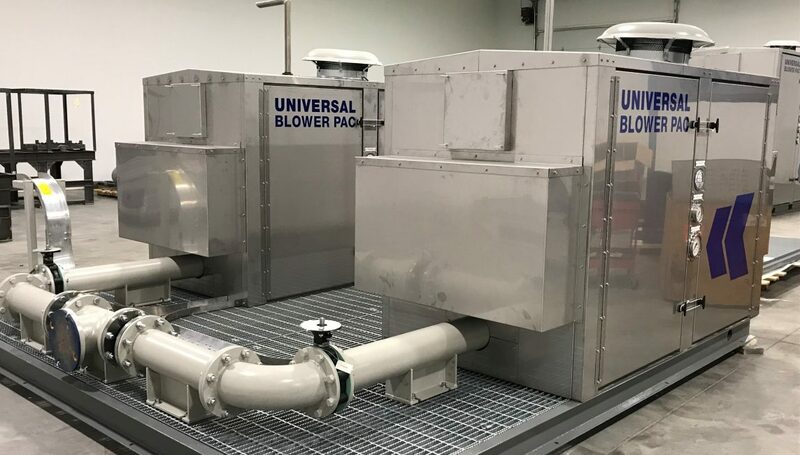 To receive more technical specs, drawings, or discuss how this efficient, standard positive displacement blower system can help you achieve your plant’s system needs, please email our Sales Engineering team at sales@universalblowerpac.com. 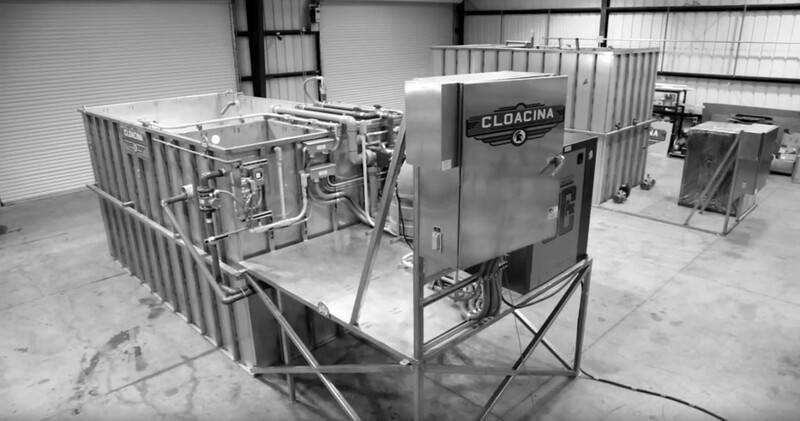 The previous blower system manufacturer was struggling to meet the quick turnaround times needed for Cloacina’s clients. 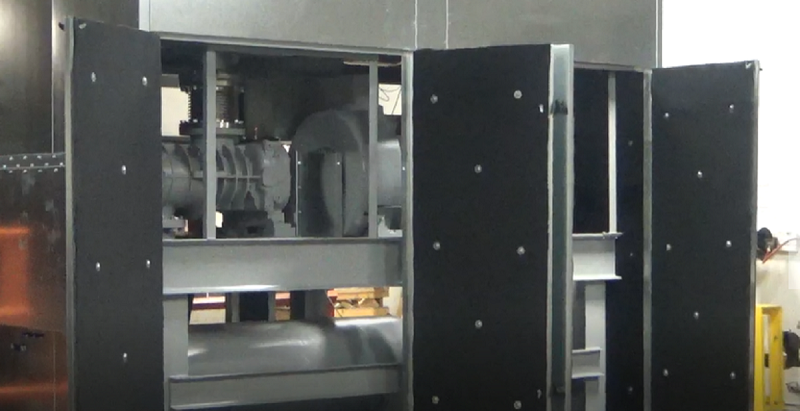 “Not only was the lead time slow to get the equipment,” said Ellison, “but engineering was slow to respond too, and we could not stand by delays that created unnecessary down time.” Cloacina quickly determined the need for a blower system manufacturer that provided not only quality and value, but fast delivery and response from engineering through to servicing. 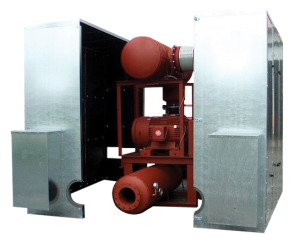 Another requirement was that the blower systems should not only be modular solutions that could be scaled, but that those solutions could be easily customized per a client’s exact needs without slowing down the delivery timeframe or driving up the costs too much. Our goal is to be known for industry-leading quality and responsive, effective service and repair capabilities. We will dilligently work to remain on the leading edge of new innovation in our industry, learning and responding to new customer demands with innovative, efficacious designs and lifecycle value in mind.